My very first blog award for 2011 is here and it is for my new food blog! The Stylish Blogger Award for Makan-Makan @ Mariuca was given to me by Denesa from Parent Times. Thank you very much for this inspirational award, I love it! I am passing this award to everyone who has been so supportive here at MMM. Thank you for your wonderful show of support for my food blog via your EC drops and EC ads, visits and comments! 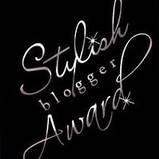 And in no particular order, I am happy to present the Stylish Blogger Award to ... Sandee, LR, Emila, Monica, Ayie, Lady Java, BlueDreamer, Maitri, GG, Bill, Foong, Caroline, Ane, Bella and last but definitely not least Nessa!